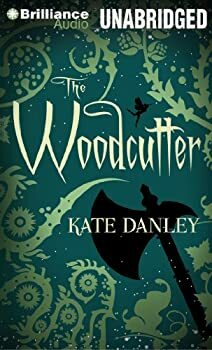 Kate Danley’s debut novel, The Woodcutter, was honored with the Garcia Award for the Best Fiction Book of the Year, the 1st Place Fantasy Book in the Reader Views Literary Awards, and the winner of the Sci-Fi/Fantasy category in the Next Generation Indie Book Awards. Her plays have been produced in New York, Los Angeles, and DC Metro area. Her screenplay Fairy Blood won 1st Place in the Breckenridge Festival of Film Screenwriting Competition in the Action/Adventure Category. Her projects The Playhouse, Dog Days, Sock Zombie, SuperPout, and Sports Scents can be seen in festivals and on the internet. She trained in on-camera puppetry with Mr. Snuffleupagus and recently played the head of a 20-foot dinosaur on an NBC pilot. The Woodcutter lives in an enchanted wood. His job, which he inherited from his ancestors, is to maintain peace and the delicate balance of good and evil in the neighboring realms of humans and fairies. One day when he discovers Cinderella lying dead on the forest floor, he knows that something has gone wrong. Further investigation shows other fairytale characters are in danger, one of Odin’s hellhounds has escaped, and someone is murdering pixies so they can sell pixie dust on the black market. The Woodcutter must figure out who is behind these evil events and set things right again. Maggie MacKay: Magical Tracker — (2011- ) Publisher: When monsters appear in Los Angeles, Maggie MacKay is on the job. No one is better at hauling the creepy crawlies back where they belong. No one, that is, except her dad, who disappeared without a trace in the middle of an assignment. Now an elf named Killian has shown up with a gig. Seems Maggie’s uncle is working with the forces of dark to turn Earth into a vampire convenience store, serving bottomless refills on humans. The only hope for survival lies in tracking down two magical objects and a secret that vanished with Maggie’s father. WARNING: This book contains cussing, brawling, and unladylike behavior. Proceed with caution. Click here for more MAGGIE stories. O’Hare House Mysteries — (2013- ) Publisher: From the award winning author of The Woodcutter comes a spirited ghost story laced with Gothic tension, romance, and mystery. Grieving widow Clara O’Hare accepts an invitation to a séance in the remote country home of Lord Horace Oroberg. Joining her around the table are Oroberg’s cad of a son, Clifford; his mousy fiancée, Violet; her overbearing mother, Hilda Nero; Norman Scettico, a renowned scientist; the lovely Marguerite Matson; and the dashing young medium, Wesley Lowenherz. Before long, the group’s fascination with the spirit world calls up something sinister, and Clara and Wesley are pulled together to solve a murder most foul in a manor most spirited. CLICK HERE FOR MORE BOOKS BY KATE DANLEY.